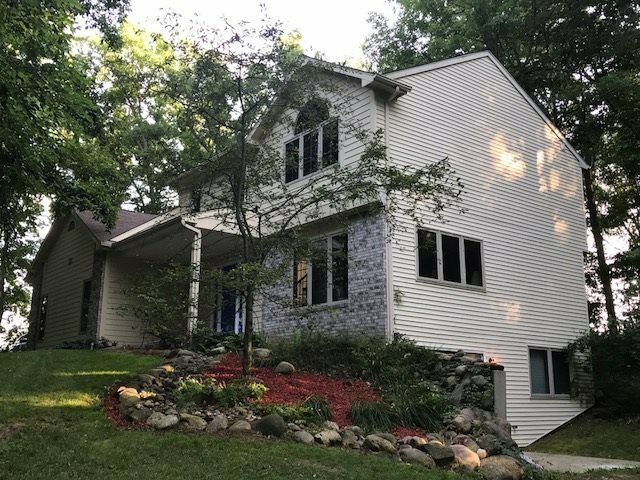 If you are wanting a private setting nestled in the woods but yet close to the lakes then this one is for you! Original owner's custom built this total privacy home on 2.29ac, 4 bedrooms and 2 Â½ baths. Many updates just completed to include: new Â¾ solid wood floors, carpet, porcelain tile, paint, appliances, stone back splash, quartz kitchen & bathroom counters, blue tooth ceiling fan. Home offers many more amenities: solid wood doors and trim, attic storage, sky lights, tons of storage, paved driveway, total privacy. When you walk in the front door you see the open stairway, Â½ bath and living room, around to the formal dining room and into the open concept kitchen, breakfast nook and family room with fireplace and French doors to the patio area with partial fenced yard that is great for the pets. Upstairs are all the bedrooms with large closets and 2 more bath rooms, laundry and loft area overlooking the family room. Go downstairs to the walkout basement, which has a finished office/den area and the rest is ready for you to finish the way you want. Home is move in ready! You also get to use the (50 foot) shared lake deeded area to Crooked Lake.